You can think about harvesting onions as soon as they are big enough for your liking. If you are interested in very thin scallions, you can harvest them 3 weeks or so after planting. If you are looking for slightly bigger green onions, you can harvest those 4-5 weeks after planting. 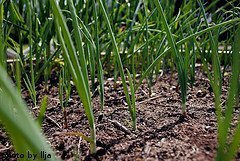 For full-sized onions, you'll need to wait a bit longer, until the bulbs push out of the ground and mature. To harvest green onions, simply grab them by the stalk near the soil and tug gently. They usually come out easier if the soil is slightly damp. 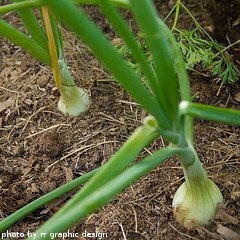 Green onions can and should be used soon after harvesting. Simply wash the dirt off and chop to the size you want. Scallions will last in the refrigerator for up to a week. However, for maximum flavor, try to eat them as soon as possible after harvesting. If you are more intent on harvesting full sized onions, you will have to wait a bit longer. Let the bulbs enlarge and mature. As the bulbs get big, they will almost push themselves out of the ground. You will eventually see almost 3/4 of the onion bulb sitting upright on top of the ground. Wait until the tops begin to turn yellow and start to fall over before harvesting onions. The tips of the tops will also start to turn brown and dry out. Again grasp the plant near the soil surface and pull gently. 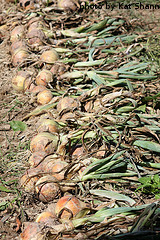 Harvesting onions is usually much easier if the soil is damp. After you've pulled the onions up, shake of the dirt, but don't wash them. Leaving the tops on, let them cure for at least a week. This will help the top of the bulbs to seal, which will prevent them from rotting for a longer period of time. 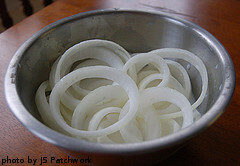 To cure onions, they need to be in a dry place with good air circulation. If no rain is expected in your area for at least a week, you can just leave them on the ground to cure. Turn them over at least once during the curing process to make sure that all sides of the onion are drying out. Some people also cure their onions by hanging them off of a fence or railing. You can also leave them out on a table, making sure to bring them inside if rain is expected. As the onions cure, the root end will begin to shrivel up and the tops of the bulbs will slowly dry out. After the onions have cured, use shears and clip off the tops, leaving about an inch above the bulb. Try and get as much dirt off the onion without using water or damaging the outer dry skins. A dry, soft brush will work fine for removing the dirt. At this point, your onions can be stored for 3-4 months in a cool, dry place. A basement or root cellar work best. You can also store them in a spare refrigerator if you have one. Ideally, you want to keep the onions between 35 and 40 degrees F. They will last the longest in the temperature range. However, as long as the storage location stays below 55 degrees F, your onions are unlikely to rot. Check on the them every week or so for signs of rot or sprouts. If the bulb begins to sprout, cut off the green portion and use the onion in the next several days. If you find a soft spot in the bulb, the onion is beginning to rot. You can cut out the soft area and use the rest of the onion immediately. If the soft spot is too big, just throw the whole thing away. Another option for storing onions is by freezing them. Remove the paper skins and chop them up, cutting the pieces to the size of your liking. Place the onions in an airtight freezer bag or container and place in the freezer. They will last for up to 6 months. If freezing is your preferred method of storage, you can start to do this immediately after harvesting onions. There's really no need to cure them as it doesn't matter if the outer skins have dried out. Now that you're done harvesting onions, it's time for a few of our favorite recipes that feature onions.